It's quite remarkable how fast the first month of 2018 has flown by. 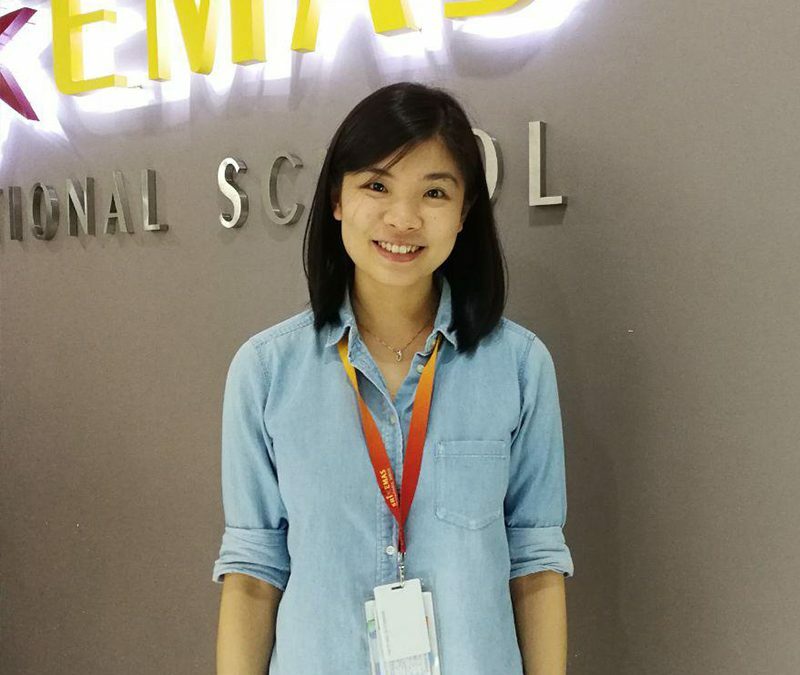 We're approaching mid-February with very fast steps and with that, it's time for another closer look at some of the people who make Sri Emas more than a school. This month, it's Tr. Jia Ying who has been teaching the lower secondary Physics for the past two years. For starters, please tell us a little bit about yourself. My name's Jia Ying, born and raised in Penang and I graduated from the University of Leeds with a major in Electronic Engineering. What subjects do you teach here and what was your first impression when you started at Sri Emas? I teach Physics and I assist in Maths classes in the lower secondary and my first impression when I came here was Wow, everybody here is so friendly! [laughs]. I had an interview here and everyone greeted me with really broad smiles. I was a little taken aback by that because you don't see that happening in most other workplaces. Students also just came up to me, waved and said hi, it was almost like a little shock to me. Prior to joining Sri Emas I was working as an engineer for more than six years, but I was based in Penang. At the same time, I would tutor my neighbour's kids on some weekends. They weren't exactly the strongest students but what I noticed was that even the slightest bit of improvement actually brought them a lot of joy and fulfilment. That was when I decided that I really wanted to get into teaching but it took a while for me to step out of my own comfort zone. It was a huge step to go from engineering to education but in a way I felt that it was now or never. My opportunity came in early 2016 when I moved from Penang to KL. One of my friends, who was already a teacher here at Sri, made the introduction and got me an interview with Trs. Melinda and Kim. If not teaching, what would you be doing instead? I guess I would still be working in my field of engineering, particulary in product development with Intel. What kind of work did that job entail? In a word, coding. I had to come up with test programmes to test their new batch of chips. I like simple DIY craftwork and recently I have picked up gardening. I'm still learning, it hasn't been very successful yet, I have killed a lot of plants so I'm still working on it [laughs] but it's fun. I think you would have to be caring and passionate about teaching because when you are genuinely passionate and you care for the kids, you will make sure to go all out and ensure you deliver what needs to be taught or conveyed to the class. Those are the motivators to keep you going. You’ve been a teacher here for a while now, do you have a favorite moment from your classes? I've been here for two years now. Favourite moment from my classes... I can't really pick one because there are so many but what really touches me is when I see the less motivated group of students getting inspired to do better or strive to be better again. That really moves me. Especially in the sciences, things are done a little differently here. Talk about how that makes a difference to students and how they learn your subjects. I think in Sri Emas we have a lot of activities that allow the students to put what they learned in the theoretical bit in the classroom into practice or real-life application, if you will. Take for instance what we do in Year 8 Physics. Recently we learned about reflection of light and it's actually part of the activity for students to build a functioning periscope. So to test their functionality, what we did was build a wall - about 1.8m in height - and they had to use the periscopes they made to 'hunt' for objects behind the wall. Along the way, you'll realise that some of the students will struggle to get the periscopes to work but that is where they pick up the skills of troubleshooting. Having to come together and figure it out to get it to work. I think this kind of activity doesn't just reinforce what they've learned in class but it also helps them understand better why mirrors or even prisms are placed in certain manners in a periscope. It really helps them a lot with their learning. What are the biggest challenges you face in your classrooms? Our classes here are made up of students of different strength, learning styles and pace. To me, I think the biggest challenges are being able to attend to everyone and making sure they understand what is being taught. That the students who are not so strong yet don't feel left out and the stronger ones don't feel bored. And of course at the same time, that everyone actually enjoys what's being taught. If there was only one thing for your students to take away from being in your classes, what would it be? One thing... Stay curious and hungry for knowledge. To always give your best in all you do, be it academic or non-academic. You'll want to look back one day and be glad that you did try your best, rather than wishing you had tried harder. I always tell students to give their best in whatever they do, regardless of whether it's coursework or ungraded. Their effort shouldn't depend on whether or not there is a grade to be scored at the end of it. Wise words. Thank you very much! As always, if you'd like to see for yourself how we do things at Sri Emas, please get in touch with us here or at 03 7865 5787 to have a chat with one of our team members about our free 3 day trial classes.